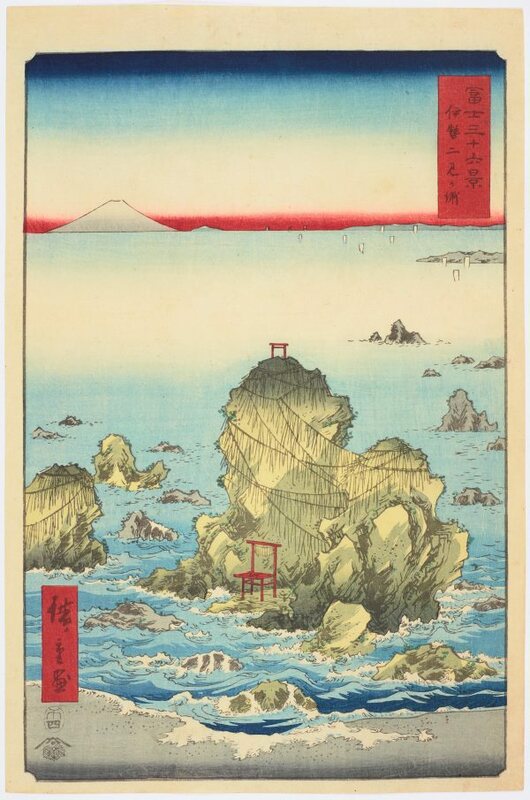 From Utagawa Hiroshige’s final series, 'Thirty-six views of Mount Fuji' (Fuji sanjurokkei) of 1858, 'Futami Bay in Ise Province' (Ise futamigaura) presents the revered Wedded Rocks of Ise. A site of significance in Japan’s Shinto faith, these rocks in the sea tied together with massive braided ropes represent the male and female creator deities, Izanagi and Izanami, a pairing has stirred imaginations for centuries. A Shinto torii gate appears on the top of the taller rock, Izanagi, and other Mount Fuji can be seen on the horizon in the distance. Ukiyo-e prints, especially those by Hiroshige and Hokusai, were popular with impressionist artists and the composition of 'Futami Bay' relates to 'Port-Goulphar, Belle-Ile', a 1887 Claude Monet painting in the collection of the Art Gallery of New South Wales.